Mechanisms underlying alcohol withdrawal sensitization or "kindling" are not well understood. In fact, the terms "sensitization" and "kindling" are used interchangeably here to describe observed exacerbation of withdrawal signs (noted in both clinical and preclinical studies) rather than infer a particular mechanism, per se. Both neuroadaptive changes in response to alcohol exposure as well as changes unique to withdrawal from alcohol most likely play a joint role in the final expression of the phenomenon (15,46). Furthermore, mechanisms underlying the development of withdrawal kindling or sensitization may be distinct from those critical for expression of the phenomenon. Experimental work in recent years is beginning to elucidate neural substrates involved in the complex and dynamic changes in brain function associated with multiple-withdrawal experience. It is well documented that excessive alcohol consumption results in neuroadaptive changes in many neurochemical systems. These compensatory neurochemical alterations are thought to mediate, to varying extents, the myriad of withdrawal symptoms (47,48). A hallmark feature of alcohol withdrawal is CNS hyperexcitability, which reflects a general imbalance in brain function characterized by reduced inhibitory neurotransmission along with enhanced excitatory neurotransmission (49). Adaptive changes in numerous neurochemical systems most likely contribute to this resultant general state of CNS hyperexcitability. Presumably, changes in any number of these systems that progressively intensify with each successive withdrawal occurrence may contribute to a persistent hyperexcitable state that is manifested as an augmented withdrawal response. The magnification or accrual of neu-roadaptive changes over several withdrawal episodes may reflect a kindling process. Thus, through this kindling-like mechanism, it is postulated that the brain is rendered hyperexcitable, such that subsequent bouts of intoxication may result in exaggerated withdrawal reactions. Among many candidate neurochemical systems that are responsive to chronic alcohol exposure, a great deal of attention has focused on the role of glutamate-mediated excitatory neurotransmission. Much of this work has focused on the ionotropic N-methyl-d-aspartate (NMDA) glutamate receptor subtype. Whereas acute alcohol inhibits NMDA receptor function, chronic alcohol exposure has been shown to result in glutamatergic hyperfunction, possibly a result of an upregulation of NMDA receptor density and/or functional activity (for reviews, see refs. 48 and 50-53). Several studies have reported an increased number of NMDA receptor-binding sites following chronic in vivo or in vitro alcohol exposure (54-58), although this outcome has not been universally observed (59,60). In some cases (61,62), but not others (63,64), increased glutamate binding has been reported in brain from alcoholic patients, as well. Amount of alcohol exposure, the radioligand employed, and brain-regional differences most likely account for the reported discrepancies. Chronic alcohol exposure also produces changes in the assembly of subunits that define various isoforms of NMDA receptors. Both in vivo and in vitro chronic alcohol treatments have been shown to increase mRNA and polypeptide levels for the NR1, NR2A, and NR2B NMDA receptor sub-units. However, results have been inconsistent regarding selective changes, and the pattern of results may depend on regional differences as well as gender differences (65-75). Congruent with these biochemical and molecular findings, electrophysiological studies involving chronic alcohol exposure and ex vivo or in vitro analysis of hippocampal slices provide further support for a role of NMDA receptors in neural hyperexcitability associated with alcohol withdrawal (76,77). Finally, additional support for a role of NMDA receptors in alcohol withdrawal comes from studies showing that competitive (78,79), uncompetitive (54,80,81), and noncompetitive (82) NMDA receptor antagonists are effective in reducing the severity of alcohol-withdrawal seizures. Conversely, systemic as well as direct (intrahippocampal) administration of NMDA itself during alcohol withdrawal increased the severity of withdrawal-related seizures (54,83). Thus, there is ample evidence to suggest that changes in excitatory neurotransmission mediated through NMDA receptors play a prominent role in alcohol dependence and the expression of withdrawal symptoms. Aside from the aforementioned neuroadaptive changes exhibited by NMDA receptors following chronic alcohol exposure, there is additional reason to suspect that alterations in NMDA receptor function may represent and important neural substrate underlying sensitization or kindling of alcohol withdrawal. It is well documented that NMDA receptors, and glutamate neurotransmission in general, play a prominent role in various forms of neural plasticity (84). This includes synaptic plasticity events such as long-term potentiation/depression (85,86) and epileptiform activity (87,88). Of particular significance is that NMDA receptors are involved in various sensitization and chemical kindling models of epilepsy (89-92). There is also some evidence for changes in NMDA receptor function following repeated alcohol withdrawal exprience. Several studies have reported enhanced behavioral sensitivity to NMDA in animals with multiple alcohol withdrawal experience. For example, our laboratory examined whether sensitivity to the con-vulsant properties of NMDA is altered as a function of withdrawal history. Mice were chronically exposed to alcohol vapor in inhalation chambers, where stable blood alcohol levels were maintained during the course of intoxication (165-185 mg/dL). 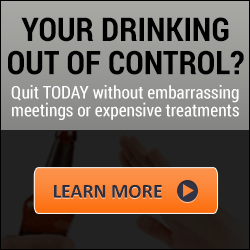 One group received four cycles of 16 h alcohol exposure separated by 8 h periods of withdrawal, a second group was tested after a single 16 h bout of exposure, and a third group was maintained in control (air) chambers, serving as ethanol-naive controls. The mice were assessed for handling-induced convulsions after being injected with NMDA (15 mg/kg; ip) at various time-points following either a single or fourth withdrawal from chronic alcohol exposure. As illustrated in Fig. 1, NMDA-induced seizures were significantly more severe in the multiple-withdrawal group compared with controls as well as animals tested after a single withdrawal. Enhanced sensitivity to the convulsant effects of NMDA was apparent at the time of withdrawal (when mice were still intoxicated), at peak withdrawal (8 h postwithdrawal), and at a more remote time point (24 h) when behavioral expression of seizure activity is typically similar among single- and multiple-withdrawal groups. Similar results have been obtained in a separate study in which seizure threshold dosage after intravenous NMDA infusion was determined in mice with single- or multiple-withdrawal experience (93). 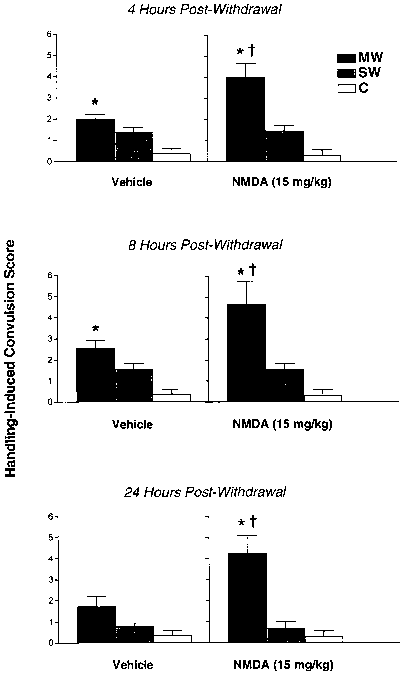 At both 8 and 24 h postwithdrawal, the NMDA seizure threshold dosage was significantly lower in animals with multiple-withdrawal experience in comparison to those that were tested following a single-withdrawal episode. Furthermore, relative to single-withdrawal and control groups, decreased latency and reduced NMDA dosage were required for multiple-withdrawal mice to transition from initial signs of seizure activity (myoclonus) to more severe end-stage (tonic/clonic) convulsions (93). In another study involving chronic administration of alcohol in liquid diets, direct injection of NMDA in the inferior colliculus reduced the amount of electrical stimulation necessary to elicit a seizure in rats that experienced multiple (10) prior withdrawal episodes compared to controls (94). Thus, there is some evidence to suggest that enhanced sensitivity to the neuroexcitatory/convulsant properties of NMDA results from multiple-alcohol-withdrawal experience. Fig. 1. Effects of NMDA on handling-induced convulsions (HIC) during alcohol withdrawal in mice with different withdrawal histories. Data are presented as mean ± S.E.M. HIC score for each group. MW: multiple-withdrawal group; SW: single-withdrawal group; C: alcohol-naive controls (see text for details of treatment). All mice were injected (ip) with vehicle (saline) or NMDA (15 mg/kg) at a time corresponding to 4 h (top panel), 8 h (middle panel), and 24 h (bottom panel) following the final (fourth) withdrawal cycle for the MW condition. HIC severity was determined by scoring the responses 5 min after injections on a scale ranging from 0 to 7. *Signifi-cantly differs from SW and C groups (p < 0.05); ^significantly differs from corrsponding vehicle-injected group (p < 0.05). 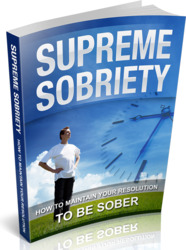 Reduce Alcohol Consumption Hypnotherapy, How To Give Up Alcohol Course, How to Treat Alcohol Withdrawal with Natural Remedies?